Over the past few years, collagen has been one of the buzzwords in skincare - every other brand out there has some sort of cream or mask with collagen in it. The claims are quite hyperbolic, claiming to restore elasticity, and reverse the aging process. I've been having quite a number of conversations with friends, co-workers, other beauty bloggers, and so on about collagen in skincare, so I thought to save myself all tht saliva I wasted telling everyone individually, I'd just blog about it here, and refer everyone to my blogpost instead (if I think they are the type of person who would read a beauty blog, I guess!). Basically, these products market themselves on the premise that applying collagen to your skin will replace the collagen lost as a result of aging. Just take a look! So much hype, so little proof. Sigh. Unfortunately, putting collagen creams, lotions, serums, masks or what-have-yous on your skin will not help replace your skins collagen. But why? Molecules (whether they're collagen, or whatever) need to be small enough are to penetrate through the layers of the skin and be absorbed. As a guideline, this limit is often cited as 500 Daltons. In fact, this guideline is so well known that often cosmetic chemists and dermatologists refer to this as "The 500 Dalton rule". Now there are exceptions to the rule, but generally, the reason why 500 Daltons rule is generally accepted is because: 1)almost all common contact allergens are under 500 Daltons. Larger molecules cannot penetrate the skin and cause allergies; 2) the most commonly used pharmacological agents applied topically are all under 500 Dalton; 3) all known topical drugs used in transdermal drug-delivery systems are under 500 Dalton. A useful corollary of the 500 Dalton rule is that the next time, if you get some marketing spiel trying to brainwash you into buying their "natural" products on the grounds that "the chemicals you put on your skin are toxic and will enter your organs and blood through your skin" (sounds crazy, I know, but some parts of the internetz are pretty aggressive about this point of view), then you can call their bluff, because by and large, most molecules as found in skincare (both the natural and "chemical" variety) are much larger than 500 Daltons. Truth is, very little in skincare penetrates our skin. If it did, it wouldn't be a cosmetic anymore - it would be a drug, and would be subject to stricter regulation. But let's get back to collagen! So how does this 500 Dalton rule help us understand how collagen in skincare works? Collagen (including collagen "extracts" in skincare) has a molecular weight of 15000 to 50000 Daltons, so they are waaay bigger than the 500 Dalton limit needed to ensure that they will pass through and be absorbed by the skin. Some products advertise that they have "smaller collagen" that will be able to be absorbed by the skin, but this is just not the case. In fact, when I tried to look up exactly what these manufacturers meant by "smaller", the best I could find was collagen in the range of 2000 Daltons and up, which still isn't going to penetrate your skin. The truth is, it's all a marketing play, as there is no real benefit from collagen applied topically - it doesn't get absorbed into your skin, but it just sits on top of your skin. So, if collagen doesn't actually penetrate your skin, then what does it do when you apply it to your skin? Well, firstly, collagen on top of your skin can function as a humectant, and this helps to moisturize your skin. But there are a lot of other equally cheap and effective humectants out there, such as glycerin and urea. So you don't really need to spend all that money putting collagen on your face when any old cream with glycerin would do the trick. Secondly, the collagen in some creams also form a film on the skin that gives the appearance of smoother skin by filling in surface irregularities. Such creams that have this effect on skin are typically also formulated with other proteins/peptides in them to enhance the film-forming effect. But, as you might guess, this is a temporary effect - it's gone as soon as you wash your face, and wash the film off. It definitely does not have any long-term effect. Even if somehow you managed to get some collagen from your skincare into your face (I don't know how that would be possible, but assuming somehow that hypothetically it happened), it still wouldn't work. This is because it would not be able to incorporate itself within the complex collagen structure in the skin. Collagen in your skin doesn't exist in isolation - it's not like you have individual bits of collagen floating around in your skin and somehow stuffing more collagen into that space will help to plump it up. Collagen is actually part of a larger structure within the dermal layer of your skin, which includes other important components, such as elastin, hyaluronic acid, and so on. The collagen fibres in your skin are "woven" in a wickerwork pattern (yes, like the baskets), which gives them mechanical strength. So any collagen that might pass through your skin will still not be incorporated into the pre-existing structure. As an analogy, if you had a shirt with a hole in it, and you tried to patch the hole by putting a bunch of broken up threads on top of the hole, it wouldn't work. The same thing applies to trying to "fix" your skin with collagen. If in fact you did want to help collagen synthesis within your skin, there are other things you could apply to aid this process that have scientific literature to back up their efficacy (Vitamin C or ascorbic acid, retinoids, and niacinamide are just a few examples), but applying collagen simply isn't one of them. What happens when collagen is ingested? Well, collagen is really a type of protein, and all proteins are composed of amino acids. So, collagen (like any other protein) gets broken down into amino acids, and thus they don't jump straight undigested from your stomach to your skin. So unfortunately, while such products claim to replenish the collagen in your skin with collagen that you eat, the truth is, once you eat it and start off the digestion process, by the time your small intestines absorb it, it's broken down to amino acids, just like any other protein. This is where a little bit of science can help a long way. Everyone knows that if you eat a piece of steak, the steak will not end up under your skin wholesale in exactly the same form in which it was eaten. So why do we believe that when we eat collagen supplements (tablets, powders, whatever), it will end up in our skin as collagen in the form that was eaten? The truth is, both the steak and the collagen supplement are digested in the same way at the end of the day - into amino acids your body uses for a variety of uses. But we fall for the marketing (did you see the picture above, man? That's some hardsell tactics! ), and it is combined with a simplistic and seductive but flawed logic (collagen in = collagen out), and this combination makes us leap to the wrong conclusion. Also, you can get your amino acids from plenty of other protein-rich foods - meat, dairy, beans, tofu - you know, actual food. There's no need to spend extra for collagen supplements. While they're not harmful, there's probably no extra benefit you're going to get from them - you supply your body with amino acids, but it's not like you can't do the same through a healthy, well-balanced diet. Besides, collagen supplements aren't cheap, and there's a much cheaper alternative available. If you do want to eat collagen, instead of splurging on a collagen supplement, you can eat gelatin - it's cheaper, and is what collagen supplement and skincare marketers have been calling "hydrolyzed collagen" (aptly called because gelatin is in fact formed from the hydrolysis of collagen). This is why companies such as PB Gelatin, Nitta Gelatin and Rousselot Gelatine, which manufacture gelatin for the food and pharmaceutical market (in the pharma industry it's sometimes used as a coating material for capsules and the like), are also able to manufacture a line of collagen for supplement use. It's because they're pretty much the same thing. So, instead of eating collagen, you could just eat gelatin, it's definitely cheaper, and possibly yummier too (who doesn't love jello? I love me some jello!). But my Collagen Supplement is FDA Certified! It Must Work, Right? Explaining this fact of digestion to some of my friends might sometimes make them confused. They might then ask, "But I saw XYZ MAGIC BRAND of collagen supplement was 'approved by the FDA' or 'FDA certified', so it must work, right?" Once again, a little knowledge will help here. Contrary to popular belief, the FDA does not regulate supplements of any kind. Let me repeat that: The FDA does not regulate supplements. The FDA's does in fact do tons of regulation, but it is primarily for medical implantables and medical equipment (so things like pacemakers, stents, X-ray machines, physiologic monitors, and hand-held surgical instruments), and for drugs, both the prescription drugs, as well as OTC drugs (like anti-dandruff shampoo). 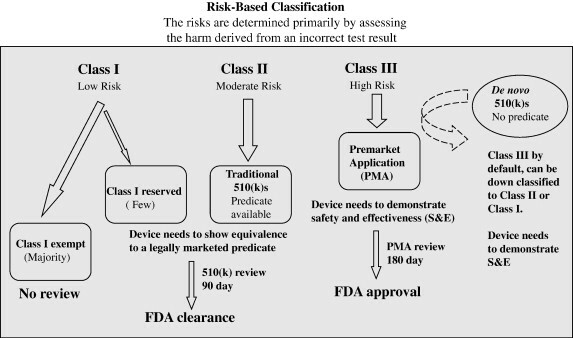 These types of products do require their manufacturers to carry out tests to prove that the product is safe for use and is effective, depending on the classification of the product (invasive products go through more rigorous testing than non-invasive ones, and prescription drugs go through more rigorous testing than OTC products). So how does this info relate to collagen supplements? Since collagen supplements are classed not as a drug, but as a supplement, it means that 1) the company making the collagen supplement does not need for it to be approved by the FDA before selling it on the market, and 2) even if there is some new ingredient, the ingredient is only reviewed for safety (i.e. FDA will ensure that it won't kill people or make people sick), not efficiency (i.e. FDA will not ensure that it will actually work to cure baldness, grow hair, or replenish collagen). So while companies selling collagen supplements (or any other kind of supplements, for that matter,) like to claim that they are "FDA certified" or "FDA registered", it's really a marketing sleight-of-hand that is intended to make the consumer think that the FDA has somehow verified that their product works, when they really don't. And of course, if a company claims that their supplement is "FDA approved", then they are just not being honest at all, since FDA doesn't approve supplements to begin with. We have already seen that collagen supplements are really just broken down into amino acids in the body, just like any other protein. A company claiming FDA certification isn't going to change how your digestive system works on ingested collagen. Conclusion: Nope, You Don't Need It! Anyway, I hope this has helped provide a sanity check on some of the hype around collagen skincare and supplements. Most of these are really marketing gimmicks and not much else. Instead of spending money on these creams and supplements that don't work, it might be wiser to spend money on a good sunscreen instead, because UV exposure is definitely one of the major contributors to aging! Since I'm something of a skincare nut, I do also have a post on sunscreen tips and information you should know, but if you want to see me put some of these principles into action, though, you can also check out my review of a collagen supplement here. Thanks for sharing! I do not take collagen supplements consistently, but I still fall for the hype from time to time. The ads always get me, darn it! Yeah, I really do believe that products that claim they have collagen are just marketing strategies. What we need are products that can boost collagen production. Well thanks for sharing so that other will know. I really appreciate it when beauty blogs take a skeptical approach to skincare claims. Your post makes me happy. Many experts say that the collagen molecules in the enticing sounding lotions and potions are so large that very few make it through the skin. Nice blog! Thanks for the informative post! I've read on blogs like cosmedmd.blogspot.com that a proven way to improve collagen on the skin is by using nonsurgical treatments such as lasers and fillers. True, you can inject collagen as a filler, e.g. to increase the fullness of your lips. 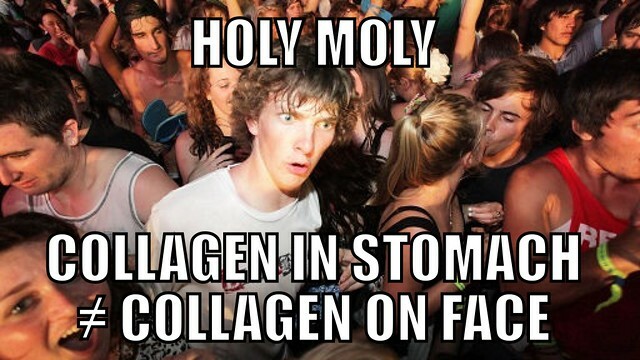 But still, the collagen molecules won't enter the cells. It will stay floating around in the tissue. If you add volume to a tissue, e.g. with a filler, the skin will look less wrinkled, because it gets stretched out. But the injected collagen is slowly degraded, and after a couple of months the effect is gone. However all filler have this effect, it's not unique for collagen. Finally someone post this. Many people doesn't know about this fact and spend much money in collagen product. I always turned down product that point out collagen is their main ingredients, waste of money.. In Poland they found a way that collagen can penetrate the skin. i have been using it for over a month (that is the capsules) and my pain from my hip and regular lack of mobility and frequency in pain has virtually disappeared. Similarly i applied the gel over the past few weeks to a brown sun spot and it has also nearly disappeared. They use it regularly in Poland, Ukraine, and Russia where many clinical tests from users are showing truly spectacular results. @Brian: To be honest I haven't seen anything of this sort. I will have to do a search on Pubmed or other reliable sources of scientific literature to see what is supported by the science. Until I can find a few studies showing that topical collagen is absorbed by the skin, I would be skeptical. @Brian Stitt: Thanks for the offer. I understand that you're talking about collagen taken orally to alleviate a medical condition (e.g. pain), so your product is quite different from what I was writing about. My original blogpost was about beauty and cosmetic products that claim to contain collagen that is absorbed into your skin. Your product, in contrast, is really a drug, as it makes drug-like claims. Drugs and cosmetics are two different classes of product because cosmetics do not change the body's physiology but drugs do. So while I can comment on cosmetics, I am not qualified to do so for drugs. So your product may or may not work (and based on your experience you have had good luck with it), but I'm not in a position to assess it. Thanks for your comments however! May I ask what ingredients they are that it penetrates the skin? Is there anything said about it? Somehow those comments make me again believe in collagen more. Comments have been deleted for excessive promotion and shilling of products. Great really thorough and informative post. The amount of bogus claims I hear and see every time i walk into a beauty hall is incredible. On a related topic do you know if those machines that some brands use to measure collagen to tell your "skin age" are based on any proper science or not? @wonderlusting: I suspect they use the amount of collagen as a proxy for the age of your skin. So basically the machine estimates the amount of collagen or whatever else, and then based on some sort of principle (eg less collagen = older skin) uses that reading to estimate the age of your skin. It's not harmful, and there may be some simple science behind it, but it's not something your doctor is going to use, I'm guessing! I don't know about this. Of course I heard that many supplements are orignally 'not needed' but at the same time, if you are taking supplements it means you do not have time to eat healthy every single day. Also about gelatine, where I live it's hard to get sugar-free one. And if I eat it with sugar, well, my skin gets worse from the sugar in it. If I take the time to cook the gelatine myself and all, why not just buy a supplement from DHC? It is not THAT expensive and saves time. I believe it helps a little, of course it does not do wonders but my skin got shiny and soft after taking it, it even helped some spots and very superficial 'scars' to disappear. I don't know what it does, but it does a bit of something. Think about it though, it's not like the government (and with that the results from science they approve) and the doctors are teaching us to eat and go for all the 'right' things that are good for our body. Otherwise, they would ask us to stop eating high-sugary foods just as they ask us to stop smoking. So who knows if collagen is good or bad, if it helps, it helps. I think it's worth a try for anyone. Homeopathy helps a lot of people too and it has mostly no effective ingredients at all. Hi, I agree with Emily's comment. The key is replenishing the Collagen the body has already lost and helping to boost the bodies ability to make more. The only way to do this is to take a 100% Collagen Hydrolized Powder. From the age of 25yrs our bodies loose 15% Collagen each year. Collagen is vital in so many areas of our body! 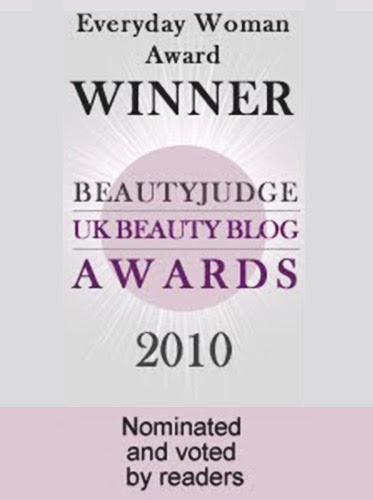 There has been a lot of research and studies which have shown that taking Collagen Capsules does help give results. No one can expect to look like they have had a facelift without having one, but there are definitely ways we can help our bodies and support our systems. I take it and swear by it. I am a firm believer in the benefits of taking 100% Collagen to help enhance both my skin and also the other benefits with hair, nails, sleep, The frustrating thing is all the misinformation that is out there and the bogus products! @Anonymous: You could certainly take collagen capsules if you want to, but I'm just pointing out in my blogpost that 1) the amino acids in collagen are readily available in actual food (sources of protein) so you don't need a capsule to get your amino acids, as long as you're eating right, 2) like I mentioned in my blogpost, if you want a supplement, gelatin is the same thing and a lot cheaper so it's not necessary to spend the money on a collagen supplement, and 3) the way protein is digested in our body means that even if you take your collagen capsules, it won't be a one-for-one collagen replacement - meaning if you eat 1000mg of collagen in a capsule, it will not all land up as collagen on your face because it will be broken down into amino acids, and those amino acids are used to build other body structures, eg muscle etc. in fact very little will end up back as collagen on your face. And lastly, collagen does not help with hair, nails, or sleep as you claim. It seems whichever vendor you buy your collagen from may have mixed up their claims. There is no protein in hair or nails (they are made up of keratin, not protein) so the amount of collagen you consume does not affect your hair or nails. As for sleep - I've yet to see actual scientific literature on it, and thus I'm skeptical. If you want to aid hair and nail growth, I suggest you take some B-Vitamin instead (some nail bloggers I know swear by biotin), as that actually aids the growth of hair and nails. And as for sleep, well, that's too much of a complex topic for either of us to claim authority over. There are mental, emotional, physiological, and environmental factors involved in getting a good night's sleep, so the best thing to do if you are really suffering from severe sleeplessness is to see a qualified doctor or therapist. I definitely would not recommend a collagen supplement as a cure-all for something as complex as this, like you do! It seems to be way oversimplifying the matter (and not to mention the lack of validation for this in the scientific literature). @Brian Stitt: Gelatin is hydrolyzed collagen. Collagen + water = gelatin. The way your body breaks it down during digestion, you end up with the same amino acids out of both of them. I think my blogpost already made this pretty clear. Also, since I don't make any money from my own blog, so I'm not too keen on people trying to make money off my blog by using it as a place to publicize their own products which they are selling. So, please don't bother promoting your stuff on my blog. It is in bad taste and rather crass. I am giving you fair warning, and will not allow any further comments for any form of shilling behaviour (whether a behaviour counts as shilling or not will be decided by me, which is fair because I'm the writer and owner of the blog). I wish you well in your business and welcome discussion (not "contact me to buy my stuff" comments), but am certainly not keen for anyone to attempt to exploit my blog as a means to make money. Thanks. Well-said argument backed up by sound evidence. However, you failed to mention how collagen is synthesized in the body from amino acids. I think that it's a topic worth discussing. There might be a catalyst or reactant that we can take/apply that helps in collagen synthesis. @Anonymous: You're right, the amino acids in our body can be used to synthesize collagen too. But it seems to me that the main limitation is not in the amount of amino acids we consume, but more in the conversion process. The fact that there is greater correlation between the amount of collagen synthesized and the application of other compounds that play a role in collagen synthesis (eg vitamin c) versus eating or applying collagen topically is pretty indicative of this. There are indeed other topical compounds you can apply to your skin to aid the process of collagen synthesis. I did not make this a focal point in my post (I wanted to focus on collagen), but I did write about it briefly, and I quote from my own post: "If in fact you did want to help collagen synthesis within your skin, there are other things you could apply to aid this process that have scientific literature to back up their efficacy (Vitamin C or ascorbic acid, retinoids, and niacinamide are just a few examples), but applying collagen simply isn't one of them." Did you read that part of the article? Maybe you glossed over it (the article is a little long, I'll admit!) so I hope highlighting that bit helps! so what if we are sick and we drink medicine? why we are cured? @Anonymous: Here's the simple one-liner answer: Because your medicine isn't collagen. Your question is like asking why when you eat meat (or any form of protein) you don't cure your flu or fever but when you take your medicine you get better. Medicines have compounds in them that are absorbed by the body's stomach or intestine, and then metabolized by the liver before going into the bloodstream. There, the drugs can do the work they're supposed to do - typically they bind to cell receptors (sites of cells that respond to stimuli and prompt the reaction of the cell) to increase or decrease the activity of the cells (i.e. prevent rogue cells from multiplying, prevent blood clotting, decrease pain felt, etc). These compounds are not proteins. Collagen on the other hand, is a protein. It is digested the same way that other proteins in meat/tofu/other food are digested. It doesn't interact with the cells in your body the way the compounds in drugs do. so does that mean that Dr. Oz is wrong about taking the Collagen supplements? @Anonymous: Please see my reply to the comment below (I believe you left the same comment twice?). so does it mean that Dr. OZ, who recently recommended to take collagen supplements as anti wrinkle treatment on his show, is totally wrong about it.? @Anonymous: Thanks for your question! The science behind collagen supplements and why they aren't that effective is real, and very well-validated. Dr. Oz is a bit more of a "holistic" kind of health practitioner, so he tends to advocate treatments and remedies that aren't always backed by hard science. So while he does have a huge following, and while such people do tend to take his advice, I honestly take whatever he says with a pinch of salt. If it can't be backed up by the kind of peer-reviewed science you can find in published articles in PubMed, then it's really more conjecture than fact. The fact is, just because someone is on TV and has a huge following, or has a "Dr" in front of his name, doesn't make their science more accurate. The good thing about science though, is that you can always do what I do on this blog, and look it up to cross-check and see if the facts match up with what people on TV say! I hope that helps! Sorry this answer took so long to arrive! I agree totally with this blogger and shes explained it so well am totally convinced buying collagen is a waste of money.If they worked plastic surgery would not be such a booming business. Thank you for your informative post. I agree completely that collagen cannot be absorbed by the skin. 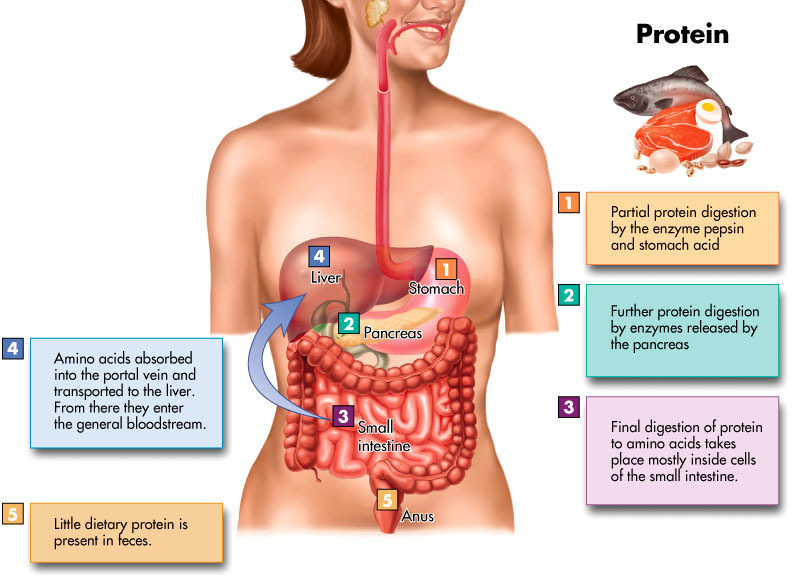 However absorption of different types of proteins is not the same since their amino acid composition is different. Gelatin contains glycine, glutamic acid, proline and alanine which obviously can be obtained in various concentration from other proteins or synthesized from essential amino-acids, but the whole purpose of supplements is to "supplement" your diet. 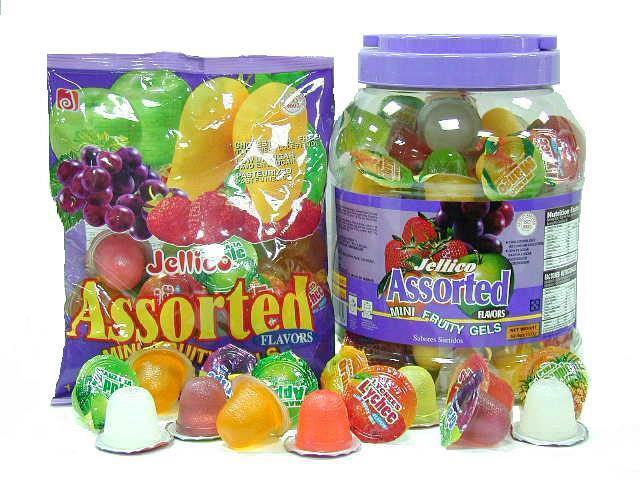 The idea of eating jello to get collagen however might backfire as the sugar will cancel out any beneficial effect from the collagen. Finally, gelatin and hydrolysed collagen are not the same thing. Just check wikipedia http://en.wikipedia.org/wiki/Hydrolyzed_collagen, it has a weight of 2,000-5,000 dalton vs 150,000 dalton for low grade gelatin. @Anonymous: The weight of 2,000-5,000 dalton that you got is probably the weight of a single collagen polypeptide chain. However, that's only the building block in your skin. You can ingest a polypeptide chain, but it won't go to your skin and bulk up the collagen there. The collagen in your skin actually exists in as a bunch of collagen fibers which weave into each other in a wickerwork pattern. Each of these bunch of collagen fibers in turn is made up of many strands of collagen fibrils, and in turn, each of these strands of collagen fibrils is made up of many triple-stranded collagen molecules. These triple-stranded collagen molecules are made by twisting 3 polypeptide chains together. So as you can see, it's a long way to go from eating amino acids or other forms of collagen (whether a fibril, a molecule, a polypeptide chain) to the skin. Your skin makes these collagen structures by itself, and your eating habits can improve your general health, but it's a stretch to say that eating a strand of collagen means it will go to your face and be incorporated by the collagen matrix there. "Even if somehow you managed to get some collagen from your skincare into your face (I don't know how that would be possible, but assuming somehow that hypothetically it happened), it still wouldn't work. This is because it would not be able to incorporate itself within the complex collagen structure in the skin. Collagen in your skin doesn't exist in isolation - it's not like you have individual bits of collagen floating around in your skin and somehow stuffing more collagen into that space will help to plump it up. Collagen is actually part of a larger structure within the dermal layer of your skin, which includes other important components, such as elastin, hyaluronic acid, and so on. The collagen fibres in your skin are "woven" in a wickerwork pattern (yes, like the baskets), which gives them mechanical strength. So any collagen that might pass through your skin will still not be incorporated into the pre-existing structure. As an analogy, if you had a shirt with a hole in it, and you tried to patch the hole by putting a bunch of broken up threads on top of the hole, it wouldn't work. The same thing applies to trying to "fix" your skin with collagen." Wow. I really appreciate all this information. Also, regarding the comments Dr. Oz has made about collagen supplements I would not believe, as he has recently been in the news for promoting products with no scientific proof of working. @musicalhouses, I have always been curious about this collagen claims cosmetics, but I have been to stingy to buy them, good to know i didn't waste my money, THANK YOU for yet another enlightening post ! It's a very useful and scientific information. 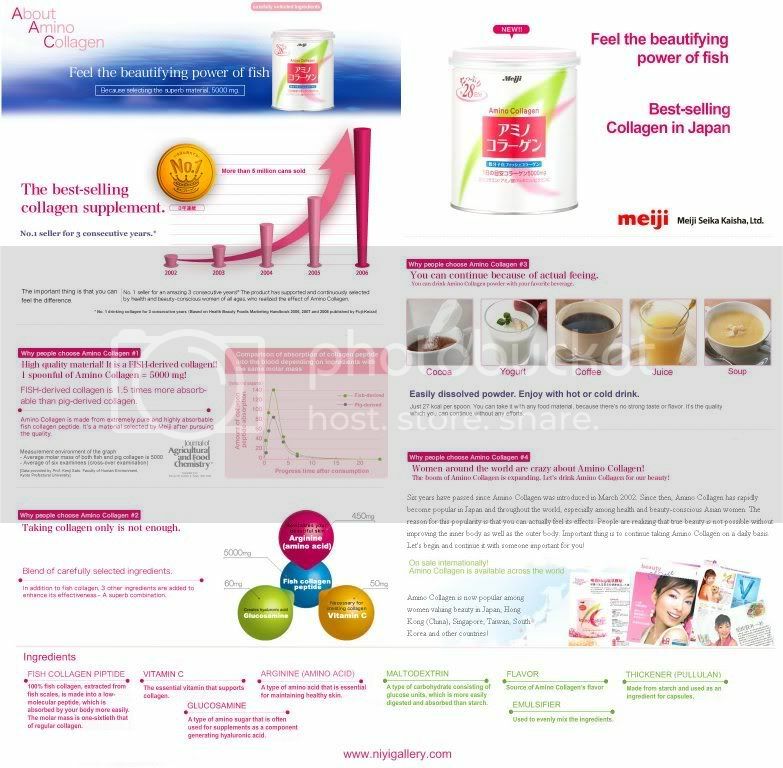 I came accross your blog in my search for any information about collagen supplement. I live in Asia. I see so many ppl swear by any collagen drink that it work on them like wonder. They only need to consume the drink for about 2weeks to see the result desired. They feel healthier, some feel their skin got smoother, and some other swear how their complexions are much brighter with all pigmentation fade away. Honestly, it sounds scarry to me. I can't believe sth can be that too good to be true. It makes me wondering now, after finding many facts about how collagen, just like what you wrote, what's actually inside those drinks? FYI, people I mentioned above are not selling, they are really the end users. Thanks for the wonderful post. I really learned a lot from it. I would love to get your take on the following research regarding collagen absorption. Their conclusions appear to contradict yours if I'm understanding them correctly. @Anonymous: Thanks for your comment! I love it when readers do their own reading up and are well informed of the science behind beauty! I'm going to break my response up into two parts because this is a long comment - so one comment for each article! For the first source you mentioned, the researchers fed some mice either soybean peptides, collagen peptides, or distilled water, and exposed each group of mice to UVA radiation. They then compared the skins of the rats after 25 days The interesting thing is that, both the soybean peptides and collagen peptides group did better than the group that was fed water. I think this makes sense, because if the mice were eating peptides (which are the building blocks of the protein in our body, including the protein in our skin - collagen itself is a protein molecule), then they would naturally have better nourishment than the mice which just drank water, which could show up in the skin health. But the interesting thing is, if you look at the charts, there isn't a big difference between collagen peptides and soybean peptides. Both benefit, but there isn't any special benefit that the collagen provides that the soybean doesn't. This supports what I mentioned in my post earlier - that it isn't necessary to eat a special collagen supplement, instead, it's better (and cheaper) to just eat protein (which is also a source of peptides anyway, and is also broken down into peptides and then amino acids in the digestive system), and just generally eat a balanced diet. If collagen peptides were particularly special, then they should be performing better than the normal non-collagen soybean peptides. But the fact that both perform the same would, to me, imply that you could probably get the same effect from a collagen supplement just by eating meant, tofu, soybeans or another source of protein. So I think what I said in my post still stands, "Also, you can get your amino acids from plenty of other protein-rich foods - meat, dairy, beans, tofu - you know, actual food. There's no need to spend extra for collagen supplements. While they're not harmful, there's probably no extra benefit you're going to get from them - you supply your body with amino acids, but it's not like you can't do the same through a healthy, well-balanced diet." This is of course, assuming that the results from mice are applicable to humans - sometimes they are, and sometimes they aren't. @Anonymous: Here's Part 2 of my reply! For the second source, it's even less convincing to me, because the researchers didn't even look at mammals, they just looked at cells grown in a lab. They studied cultured human skin cells (on an agar plate or a petri dish), so the results may hold in experimental conditions, but they are quite far removed from what happens when humans ingest it, because our bodily systems are quite a lot more complex. Basically the researchers cultivated the fibroblast cells found in human skin (so not even the entire skin, just some cells found in the skin matrix) in some petri dishes/agar plates/etc, and then treated some of the plates with collagen, and then counted the number of cells that grew on the plates after some time (they also had a control plate). And because the number of cells increased relatively to the control plate, they take it to mean that it has some effect. But I'm not sure how, in a normal human being, the collagen would reach the fibroblasts in the first place (because they don't really penetrate the skin, and if you eat the collagen, it has to get through your digestive tract first, where it is broken down into all these peptides and isn't collagen anymore), and whether, in the environment of normal human skin, whether the results would be replicable. The set up is so far removed from a normal human body that I don't find the results very indicative at all. I think what would really convince me would be a study published in a good reputable peer-reviewed journal, with actual oral or topical supplements taken by human volunteers, and a control group, and with the skin's elasticity etc. measured via more means than volunteer self-assessment. Ideally this study should be replicated by other researchers (or supported by other researchers in similar studies) so that we know it's not just a one-off. So far I've not seen any of this yet. Most of the studies I've seen are quite far removed from in vivo human tests, and I think to draw the conclusion that these studies can be extrapolated to humans is quite tenuous. As Ben Goldacre so nicely (if a bit sarcastically) puts it in his book Bad Science, "you have to be very cautious about how you extrapolate from what happens in some cells in a dish, on a laboratory bench, to the complex system of a living human being, where things can work in completely the opposite way to what laboratory work would suggest. Anything can kill cells in a test tube. Fairy Liquid will kill cells in a test tube, but you don't take it to cure cancer." Hope this helps! Very nice article! Thanks for you post very helpful. Hi, very interesting post! I have a few questions regarding the skin absorption and the theory of 500 Dalton rule in over the counter skin care products. Does that mean ingredients in skincare products are less than 500 Dalton to be absorbed by the skin and showing their intended effect? E.g. vitamin c, retinol, chemical sunscreens, jojoba oil, wheat germ oil, evening primrose oil, and other essential oils. Furthermore, regarding mineral oils, isn't it a petrolatum derivative? Is this actually absorbed by the skin or only sits on top of the epidermis? Overall, how do you actually distinguish which ingredients will be absorbed by the skin and which are not? Please help me! (I use bio oil on my face which contains purcellin oil, mineral oil - which is a liquid petroleum - , and others. But these 2 ingredients concern me the most). Ps. 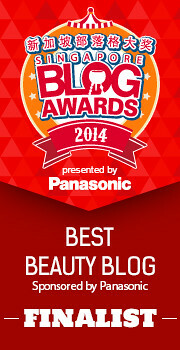 I also found a blog that analyses bio oil's ingredients. Do you agree? So, if there are temporary benefits, even though they wash off when you cleanse your skin, perhaps it is worthwhile to use before attending a special event where you want to look your best, just for that day... would you agree? @Christyrl: Yes, that is certainly one way they can help! They may not give a long term improvement in skin, but a quick temporary boost for when it needs to look it's best is always welcome, too. So, if there are temporary benefits to the collagen mask that last until you wash your face, does this mean it could be good to use in the morning before a special event at which you want to look your best? A dermatologist told me to take collagen peptide supplements to improve my skin. It contains Peptan, that claims that the "collagen peptides are so-called Type 1 Collagen Peptides. This means they are identical to the collagens found in human bones and skin. Peptan is a high-purity, natural bioactive product, containing more than 97% protein (on a dry weight basis). Peptan collagen peptides are optimized for high bioavailability and activity, and their hydrolyzed form makes them easily digestible by humans." Is there such thing as an optimized way to absorb protein? This way I believe that the supplement would increase the intake of protein assertively, when there is a possibility that the consumption of protein found in foods would not have guaranteed absorption. I am just trying to understand my diagnosis because the supplement is very expensive and "the science" behind it is not clear to me yet. 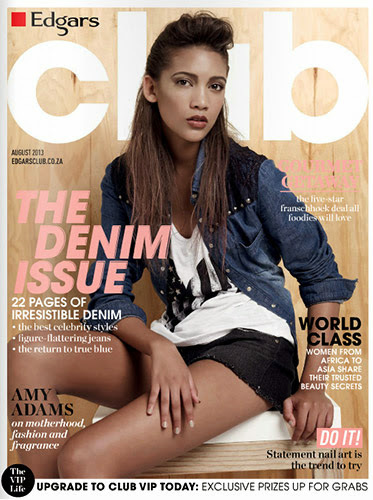 Hi - I was very interested in this article and wanted to ask if you have heard about cryo facials? They use very cold air, (130 degrees Celsius) to penetrate the skin. The cold temperature is said to stimulate collagen production. Do you have a view on this? 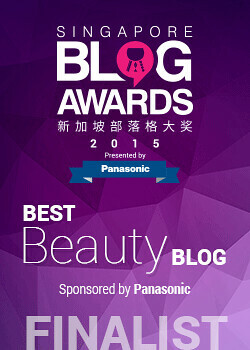 Just stumbled upon your blog and I admire how you look into the science behind beauty products. It's always good to be well-informed on how certain chemicals/products work so as not to fall for exaggerated items! I've been taking hydrolysed collagen powder for 2 weeks or so, and yes, I notice difference in my joint and mascule pain (improved), skin and hair, but unfortunately I seem to be putting on some weight. I'm eating less, not eating sugary snacks and cakes anymore, and doing regular exercise and yet somehow I get more loose far around my belly. I'm still taking it for my skin and joint pain though.